Ah, summer. 'Tis the season to be so overwhelmed with happy little squash plants that you wind up eating so much zucchini and pattypan squash that you can't even stand to look at it anymore; that is until the seed catalogs come out and you forget that you don't actually need to plant twelve squash plants of each variety because one of each would probably be enough. And this is how you wind up getting ten precious little pattypan squashes a day. Not to mention the zucchini. Oh sweet Lord in heaven, the zucchini. Don't even get me started on the zucchini. Spoiler alert: everyone I know is gonna get zucchini bread for Christmas. But at least the zucchini I can just throw in the food processor, chop it up, and freeze it into what feels like sixty million gallons of ready to go zucchini puree. The pattypan squash though? While squash bread is probably a thing I decided to change it up a little and stuff some awesome squash boats. Hopefully by freezing these little suckers I won't have to eat so much squash that I can't stand to look at it anymore! It's hard to eat just one! Scoop out a hollow in your squash to put the filling in, much like carving a pumpkin. You can save some flesh and small seeds to add to the filling if you like, but I throw mine into the food processor to use for squash bread later on down the line. Hey, waste not, want not. Right? Meanwhile brown the hamburger with the onion and garlic. Salt and pepper to taste. Drain. Also, meanwhile boil the rice according to package directions. Drain. 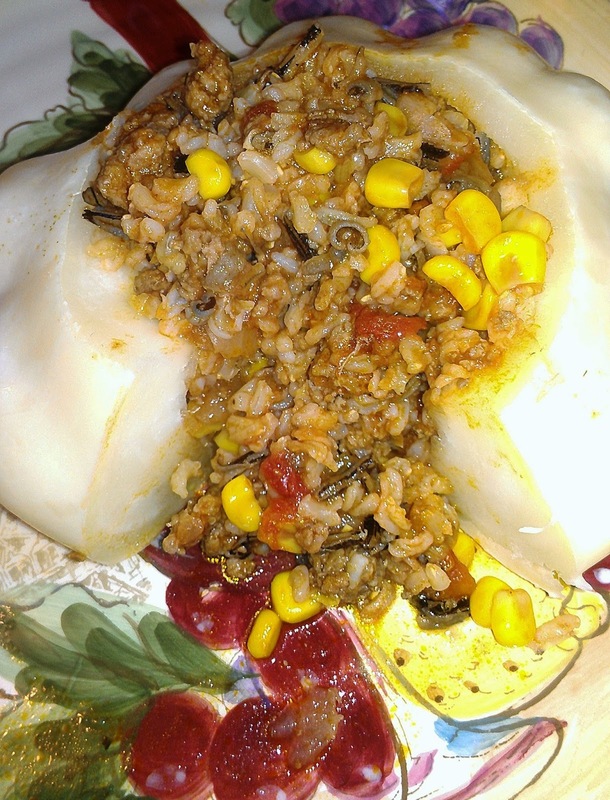 Mix the hamburger, rice, corn (drained), stewed tomato (not drained), and tomato sauce together. Let simmer until reduced. I chopped at the tomato chunks with the spoon to make them bite sized.